Oh, the pressure of what to say on Day 1 of my online journal! 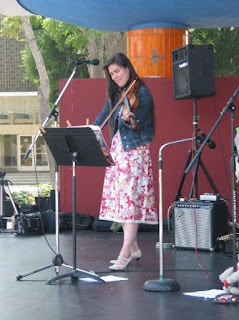 About me: I'm a musician (fiddle, mandolin, singer-songwriter, some acoustic guitar) in Los Angeles. I play fiddle in a bluegrass band called Murphy's Flaw and with a good ol' acoustic country band The Hello Darlin's. I've also performed with Dime Box Band, The Hollow Trees, Dafni, Wil Forbis, Sarah Stanley and Ghost Town. In my quest to seek attention on the internet, I'll be posting some music clips of my work as a fiddler, singer/songwriter and whatever else I feel like expressing. Woo hoo! 2 comments already. Thanks Kid! Everybody, check out my awesome sister's blog. Coincidentally, it was my inspiration for this blog.